Paliuli Cottage #7 is one of eight detached condos in this small and private development of 2 acres. It feels like a single family residence with its own private plunge pool and a walled terrace to give you privacy. Two bedrooms/two baths. Fantastic location within the development. 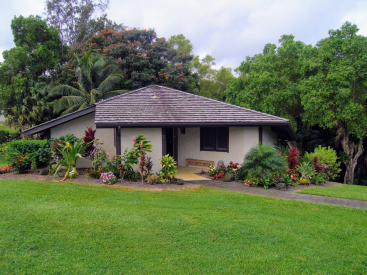 This “cottage” is in excellent condition with many updates: bamboo and travertine tile flooring, plantation shutters granite counter tops, cherry wood cabinets and stainless steel appliances. The roof was replaced in 2008 and a new gutter system was installed in 2010. This private condo is offered fully furnished and ready for you to move in, use as a second home or start a vacation rental. The Homeowner Dues include weekly pool maintenance and quarterly interior pest control. Assigned covered parking for one car per unit. Pets are allowed with prior written permission of the Board.